Emmy Noether was born Amalie Emmy Noether in Erlangen, Bavaria, Germany on March 23, 1882. She had three other siblings, but all of them besides her brother, Fritz, passed away during their childhood. Her father was also a mathematician, Max Noether, and he sparked her interest for math later on in her life. As Emmy grew up, she studied a lot of different subjects, but she did not put a lot of emphasis on math until later. Noether spent a lot of time studying different languages, and she learned a lot from her mother about cooking and cleaning. Once Emmy graduated high school, she wanted to be a teacher, which led to her taking an exam to become a teacher of English and French to young women. She passed this test easily, but this led her down a difficult road ahead. She could not take classes her like her brother could because she was a woman, so she ended up auditing classes at the University of Erlangen instead. During her time auditing classes, Noether learned about mathematics in depth. After this, she took a test to become a doctoral student in mathematics. She passed this test and then went on to take five more years of classes. After those five years, Emmy Noether became the second woman to ever get her degree. Once she had a doctorate in mathematics, Emmy wanted to focus on becoming a professor. She could not get a job teaching because she was a woman, so her father allowed her to help him run his classroom. He was a professor at the Mathematics Institute in Erlangen, and she would fill in whenever he was sick or out for the day. Throughout her time helping her father, she did research and wrote papers on what she found. Emmy ended up working for her father for 10 years. Soon after she was done working for her father, David Hilbert invited her to teach at the mathematics department in Gottingen. Hilbert felt that Emmy could help him define one of the theories of Einstein, and she accepted the position. There were no women on the faculty at that time, but she stayed, and after three years Emmy was able to earn a salary. 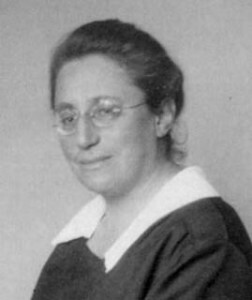 Soon after arriving in Gottingen in 1915, Emmy created Noether’s Theorem. She also accumulated a following of students known as “Noether’s Boys.” In 1928, she decided to accept a teaching position in Moscow at Moscow State University. During her time there, she taught classes and contributed to the Galois theory through research and studying. In 1933, Germany was taken over by the Nazis coming into power, and that is when all Jews were to be pushed out of the Universities. Her brother, Fritz, then moved to Siberia and she decided to move to the United States to become a teacher at Bryn Mawr College. In 1935, Emmy passed away. She was cremated and her ashes were spread at Bryn Mawr under a walkway.